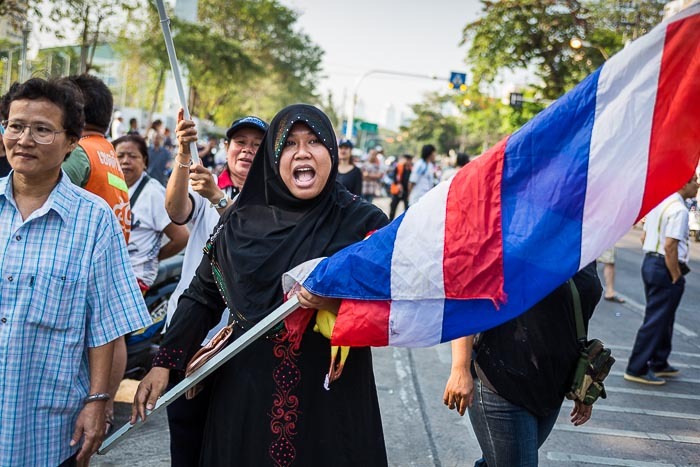 A Thai Muslim woman carries a Thai flag on her way to confront anti-government protestors who disrupted voting in Bangkok Sunday. Thais voted Sunday in what was supposed to be the final round of voting after Prime Minister Yingluck Shinawatra dissolved parliament on December 9. Early voting was last week and it didn't go too well in Bangkok and the southern provinces. There was no reason to believe regular voting would go any better Sunday. 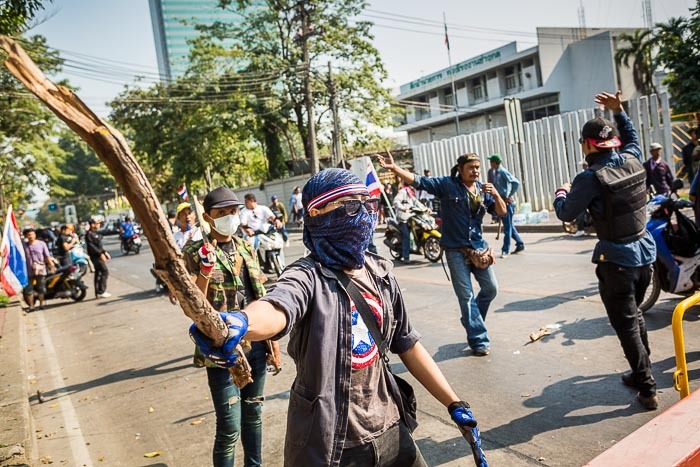 An anti-government protestor carries a club while taunting people who were trying to vote. Most Thais were able to vote Sunday. There were no problems in the north and northeast, home base of the governing Pheu Thai party. There were only a few problems in central Thailand. There were no votes cast in southern Thailand (home base of the anti-government opposition) because no candidates were allowed to register in the run up to the election (candidate registration was blocked by anti-government protestors). The same protestors, and their threat of violence, prevented people from signing up to work the election. There was no one to staff the polling places. Voting in Bangkok was haphazard. Many polling stations were open but roaming gangs of anti-government protestors went from polling center to polling center to intimidate people out of voting or shut down the polling center. Many were armed with clubs and sticks. Some were carrying guns. People who wanted to vote try to confront armed anti-government protestors. Police kept the two sides apart. I went to a polling station in Ekkamai early. It was a normal day there, although turnout seemed light. I also went to a polling station in a district office in Din Daeng, long a flashpoint in Thailand's political problems. Din Daeng was a weird scene. On one side, a group of men in their 20s and 30s, most wearing baklavas and masks, carrying sticks and guns and on the other side grannies, aunties and old men carrying voter ID cards. Police kept the two sides apart. Every so often, voters would get frustrated at being denied their rights. They would start chanting "respect our vote" or "let us vote." They would charge and occasionally break through police lines and run down the street towards the line of armed anti-government protestors. 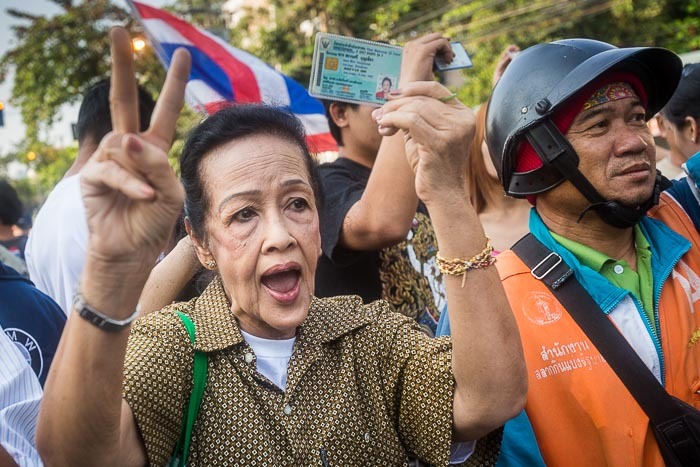 Thousands of people have died earning and keeping the right to vote in Thailand, and these voters, whether they were anti-government or pro-government, were not happy about a gang of toughs preventing them from voting. The protestors would stand at their barricades waving clubs and taunting voters until someone would step in front of the voters and urge them to calm down. At one point an anti-government protestor pulled a small semi-automatic pistol and fired it towards it voters. No one was hit by the round. After about two hours of the back and forth, election officials declared the polling place closed and the protestors jumped into their pickup trucks and sped away cheering and laughing. Voters then rushed the polling place and demanded a chance to vote, but it was too late. Workers had already shut it down and left. There are more photos of election day in Bangkok (and the "Shutdown Bangkok" protests) in my archive or available from ZUMA Press.